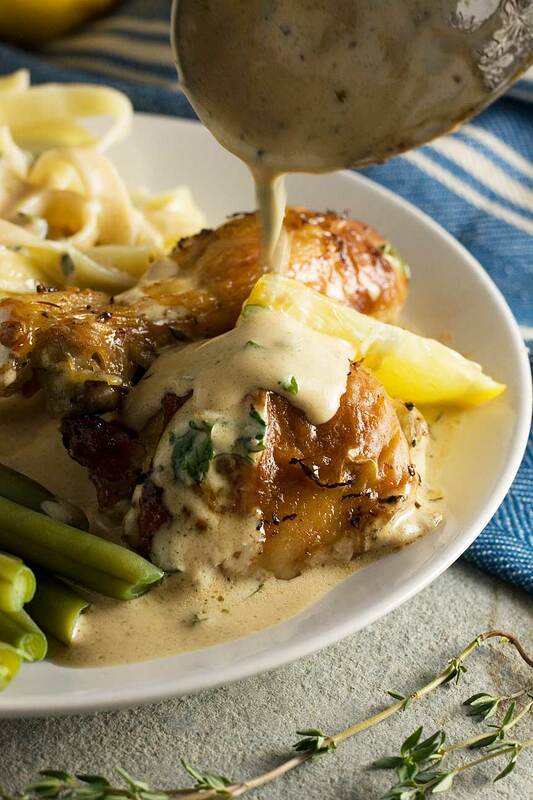 When life gives you lemons, make this baked lemon chicken with a delicious yogurt sauce to cheer yourself up. I know, cheesy. But do try it anyway because it really is good. And you only need 6 simple ingredients. There’s something about lemon in a recipe that always grabs my attention. In fact, some of my favourite recipes on the blog have lemon in them. Sticky lemon curd and blueberry cake? Mmm, yes please. 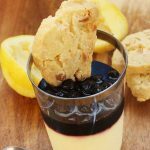 Lemon posset with blueberries and macadamia shortbread? Yup, I’ll have one of those, too. Lemon bakewell slice? Pass me three. I love lemon desserts, but I have to say I’m just as much of a fan of lemony dinners (like this lemony asparagus and prosciutto ricotta farfalle). And now that spring is officially here, I think it’s definitely time for a new savoury lemony kid-on-the-block. You can’t beat a good creamy chicken dinner as far as I’m concerned, but I’ve never thought of making one with yogurt instead of cream before. I assumed the yogurt would just curdle if heated, but it doesn’t because you stir it in right at the end of cooking. So the yogurt makes this healthier than if you used cream, of course, and it’s just SO EASY. 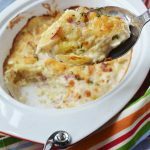 You roast the chicken in an oven-proof skillet or cast iron baking dish for about forty minutes with lemon juice, wine, chicken stock and thyme, then you remove the chicken and add yogurt to make that lovely tangy, creamy sauce. 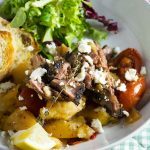 The ‘lemony factor’ in the sauce is fairly intense, which I love, but if you prefer a more subtle flavour just reduce the amount of juice you use. For me, one small lemon makes it just perfect. THE BEST THING IS… THIS IS A ONE POT MEAL! With only 6 ingredients (if we don’t include salt and pepper). Meaning more time putting your feet up and feeling satisfied after your lovely creamy lemony meal and less time doing the washing up. 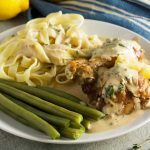 I served my baked lemon chicken with tagliatelle, which I think works really well because you can drizzle some of the sauce over that as well. But potatoes, rice or some nice fresh bread would be great too. If you use one of those stove-top to oven cast iron skillets , by the way (which are perfect for this), just don’t do what I did – get your lovely baked lemon chicken out of the oven, then be so distracted by how yummy it looks that you grab the handle of the skillet. Yes, ouch times about a hundred. Yes, hand submerged in icy cold water all evening. Yes, couldn’t get to sleep until I tied a damp tea towel around my hand to stop the horrible burning feeling. Anyway, enough about that (not too much damage done, despite the fact I don’t seem to have a fingerprint on the ring finger of my left hand any more.). 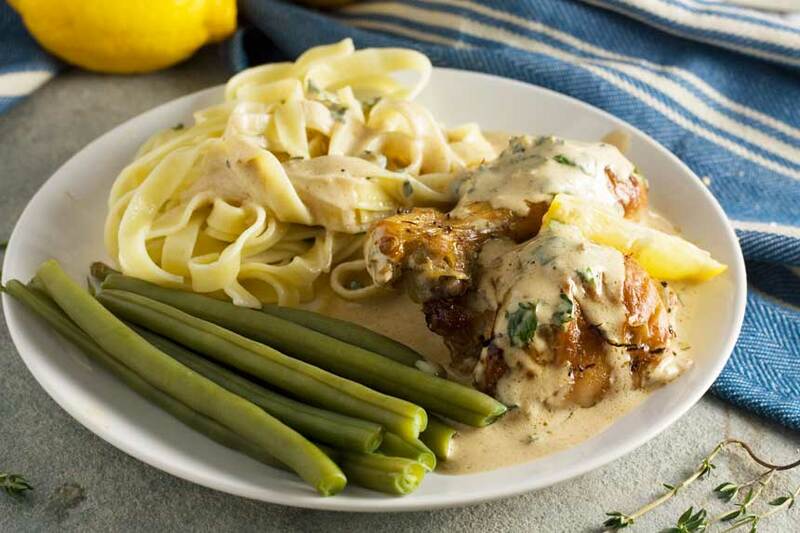 Just make sure you give this gorgeously creamy lemon chicken with yogurt sauce a go. If you’re a fan of lemon like me, I really think you’ll love it! A delicious baked chicken dish with a creamy lemon yogurt sauce. When life gives you lemons, make this quick and easy one pot meal. Only 6 ingredients! Pre-heat the oven to 200C / 390F. Place the chicken (skin-side up) in a cast iron skillet or wide-bottomed pan (oven-proof). Pour the chicken stock, white wine and lemon juice all over the chicken and into the pan and add the thyme. Grind over some salt and pepper. Bake for about 40 minutes or until the chicken is browned and cooked through. Transfer the chicken from the pan onto a plate and cover with foil to keep warm. Transfer the pan with any remaining juices to your stove top and add the yogurt, stirring in all the juices and any ‘gnarly bits’ around the side of the pan. Now add as much chicken stock as you need to thin the sauce a little and make it pourable. Season with more salt and pepper to taste. Add the chicken back into the pan and heat gently for a minute or two. Serve the chicken immediately with tagliatelle and your choice of vegetables (if you wish), spooning plenty of the lovely sauce over the chicken. 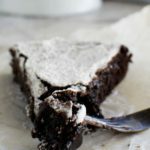 1 A cast iron skillet or baking pan is perfect for this recipe, but if you don’t have anything like this, just bake in a baking dish and then transfer the juices to a saucepan to make the sauce. 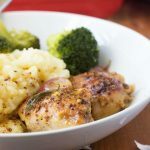 2 You can use skinless boneless chicken thighs in this recipe, but if you do, reduce the baking time to 20 to 30 minutes (depending on the size of the thighs – just check to see if the chicken is cooked all the way through after 20 minutes, then cook a bit longer if necessary). 3 Don’t overheat when you’re making the sauce – you don’t want the yoghurt to curdle. 4 The amount of stock you might have to add when you’re making the sauce will depend on your oven / which pan you use / how big the chicken parts are. You want the resulting sauce to be of a nice pouring consistency - a bit like gravy. 5 I always add a drizzle of olive oil to the tagliatelle straight after draining to stop it sticking and keep it moist. 6 I love this dish with tagliatelle, but if you prefer, you can serve the chicken with potatoes or rice. I’m with you – I can start and end a meal with lemon. 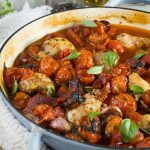 This looks so delicious – a one pot midweek dinner can’t be beaten. Hi Nancy. Totally agreed! Lemon’s so versatile, going really well in sweet or savoury dishes. One of my favourite foods! I am loving lemon in my meals at the moment. It adds so much flavour, without adding many extra calories. You’re right, Dannii. Always good to have a few lemons in the fruit bowl! I love an easy and comforting dish and your sauce sounds delicious. Lovely recipe. I’m with you, Helen! Lemon in a dish always grabs my attention too! Especially when paired with chicken! And I’m loving your yogurt cream sauce – it sounds spectacular! And… it’s one pot!!! Seriously, you knocked this one out of the park! Pinning, pinning, pinning! Yes, I love lemons! The best way I can think to describe them is that they bring sparkle! Gorgeous photos – that first one is a real knockout. I’ll be trying this beautiful dish pronto! Thank you, Marissa! That’s a great description of lemons. They’re very sparkly, even in colour! OH MY GAWSH!!! Helen – I flinched just thinking of you grabbing that skillet pan!!! I hope you are ok! Though I see why you were distracted – this chicken sure does look ah-mazing! And that lemon sauce is to die for! Thanks, Shashi! Actually, the damage to my hand wasn’t as bad as I thought it would be. I think I did the right thing by holding my hand in cold water all evening. Glad you like the chicken – one of my current faves!! Hello Dawn! Thanks so much for passing by and taking the time to comment. I think I must be one of the world’s biggest lemon fans. I love that there are so many uses for it (even cleaning!). Hope you give this a go some time – I think you’re right that it’s a bit of a winner! 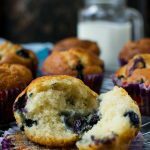 Love recipes with lemon, too! And it goes well with chicken! Great dish, love the sauce! 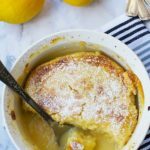 Lemony deliciousness all in one pot. Oh bummer…a domestic injury is the worst. Hope you heal up soon as can’t wait to see what you cook up next. Putting this recipe on my meal plan for next week. Just pinned! J’aime beaucoup ton plat et le fait qu’avec seulement 6 ingrédients on peut faire un plat unique très bon et savoureux. Je suis aussi une inconditionnel du citron, j’adore! Love creamy chicken! This looks delicious Helen! 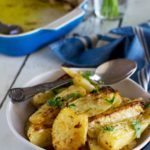 The tangy lemon sauce sounds great and I’m loving that it’s made with Greek yogurt! 🙂 One-pot meals are the best! Can’t wait to give this a try – pinning! Thank you so much, Jess! I was amazed that the yoghurt doesn’t curdle, but honestly, it doesn’t. I felt very smug eating something so creamy and knowing that it wasn’t all that bad for me! Hi Helen, citrus is in season here in the southwest, I love lemon such a great way to bring flavor into any dish, love this! Hello Deborah – thanks so much for passing by! Really happy you’re thinking of giving this a go! I’ve never tried freezing this, but I’m not sure if it’d be the best idea. I know supermarket yogurt generally doesn’t freeze well because it alters the texture. Yes, more stock would be fine – no problem! Hope you enjoy it!